Blowout Sale! Free Shipping Included! Save 60% on the Kid's Desk Set - Adjustable Children's Table and Chair - Grows with Your Child! (Pink) by Einstein Kids at Indsight. MPN: AEDESKPK. Hurry! Limited time offer. Offer valid only while supplies last. 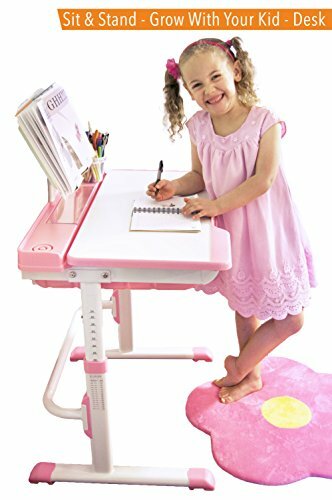 Kid's Desk Set - Adjustable Children's Table and Chair - Grows with Your Child! (Pink) No matter your child's aspirations - let us grow with you! No matter your child's aspirations - let us grow with you! With your new smart adjustable children's desk, this is the perfect desk for most kids 3 - 10 years old. Desk Height Adjustments: 21" - 30.5"
Chair Height Adjustments: 11.5" - 16.5"
Desk Footprint: 26" x 19.5"
Chair Footprint: 15.5" x 16"
Writing Surface: 27.5" x 13"
Desk Surface (w/ cup holder, fidget ring etc. ): 19.5" x 27.5"
Storage Drawer: 18" x 22.5" x 3.25"
LET US GROW WITH YOU: We understand - kids grow FAST! So we want to grow with you. Our adjustable desks (and chair) are perfect for 3 - 10 year olds. TILTABLE LARGE DESKTOP: The large desktop can tilt up to a 45° angle. It's perfect to customize for all of your child's activities like drawing, reading, or writing. Great for your little Picasso and of course... Einstein! SPACIOUS STORAGE: Your child's new desk will come with a roomy pull out drawer. It's great for keeping and organizing all their books, papers, small toys, and other knick-knacks. ADJUSTABLE MATCHING CHAIR INCLUDED: While your new desk can be used as a standing desk for your little ones - we will also include an adjustable matching chair! If you have any questions about this product by Einstein Kids, contact us by completing and submitting the form below. If you are looking for a specif part number, please include it with your message.